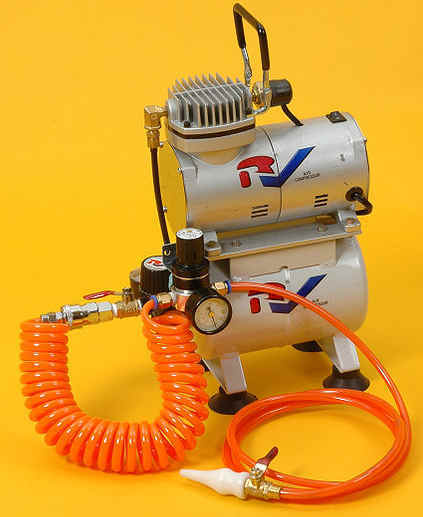 Electric compressors range from very large 3 phase stationary machines that are permanently installed in a factory or workshop to drive dozens of air operated machines to the tiny mini-compressor seen below that is used by hobbyists. Above is a larger size compressor that is the type used to take on construction sites by many building trades. I had one just like this for many years. It is just about as big as you can go and still be able to use single phase power. It will drive a large nailgun, a standard spray painting gun and other similar tools. It has a fairly large air receiver. This takes a while to fill up and bring to pressure at start up, but the fact that it is fairly large means that when the on-off cut-outs are set correctly then the air in this cylinder provides steady pressure without the the motor having to run every time a tool is used. The electric motor is separate from the compressor so that if one or the other gets damaged or wears out it can be replaced without buying a complete new unit. It has standard "Vee" belt drive between the motor and compressor. The air receiver tank to a certain extent removes moisture out of the air, so that it does not pass downstream to the tools. A plug is provided at the bottom of the receiver and the collector water should be drained from time to time. 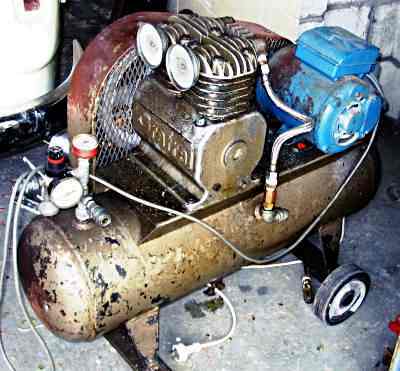 For an on-site team that wants to use a few air tools at the same time then a better option is to go for a larger capacity petrol engine powered compressor. In general air tools are more expensive than their equivalent electrical counterparts. Add the cost of a compressor and it's necessary hoses and fittings. Neither one will be of much use without the other, so why the popularity of air tools in general? The answer is simple, compared to electric tools air tools work harder, last longer and because of their general simplicity they need less maintenance. Small 12volt compressors are often found in recreational vehicles for the odd emergency tyre repairs. PSI pound per square inch. This is the amount of pressure that the compressor can reach and work at comfortably, and that a tool need to run efficiently. Tank Capacity The larger the holding tank the less length of time the compressor has to work. For instance a compressor with a decent tank volume (the one in the picture has a 4 gallon capacity)will on start up work until it reaches it's cut out pressure and then it will stop. The compressed air may then be be used to drive air tools from the tank only, until it reaches it's cut in pressure, say 20psi lower than the cut out PSI figure. This is a great benefit, storing the air in that tank. For the use of smaller tools many compressors can go a couple of hours or so without cutting in again. Compare this to a smaller tank supplying air for a spray gun. The compressor may have to run continuously just to keep up. So if you are looking for air tools, study the specifications and the manufacture's guidelines of the tools. Then pick a compressor that will comfortably run the largest of them.